Ho Chi Minh City, 14 November 2018 – Canon, a world leader in digital imaging, today announced its smallest photo printer that uses no ink for printing, and even prints upside down. 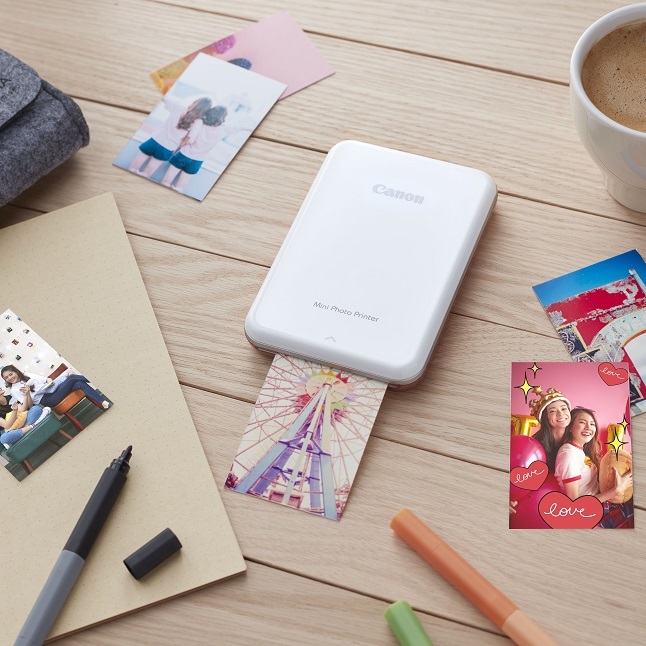 The Canon Mini Photo Printer comes to the rescue of precious memories locked away inside smartphones, bringing them out into the world with a bold dash of personality and style. The printer’s slim profile size translates to impressive portability – so compact that it fits into pockets, purses, long wallets and jackets easily. A built-in battery ensures true mobility without the need for the device to be attached to a power outlet. Bluetooth pairing with a smartphone happens with a simple press of a button located at the side of the printer, and full operation does not require devices to be arm-locked in the vicinity of a secure wireless network. The Canon Mini Photo Printer is available in Slate Grey*3, Rose Gold*3 and Mint Green*3 and the box configuration includes the printer body, a starter pack of ten sheets of photo paper, and a charging cable. Canon is a world leader in digital imaging and photography solutions. Canon Singapore Pte. Ltd. is headquartered in Singapore and serves as the strategic planning, service, marketing and sales hub in South and Southeast Asia. In addition to the domestic market, the company manages markets in 18 other countries including subsidiaries in India, Malaysia, Thailand and Vietnam. Parent company Canon Inc. owns nearly 300 companies with a staff of nearly 200,000 people worldwide. In order to meet technological innovation and advancement, Canon commits to spend 10% of its annual revenue on research and development (R&D). Canon has always been one of the few leading corporations patented frequently over the past 19 years. As a Fortune Global 500 company, Canon is guided by the Kyosei philosophy of living and working together for the common good. Canon products have been available in Vietnam since the early 1980s through authorized distributors. Over the past 14 years, Canon has marked its active presence with the establishment of four manufacturing plants in Thang Long - Hanoi, Que Vo and Tien Son - Bac Ninh, Pho Noi - Hung Yen and Canon Marketing Vietnam Co., Ltd. In addition to creating jobs for more than 25,000 people, Canon also contributes relentlessly to the development goals of Vietnam through meaningful social activities. Canon Marketing Vietnam Co., Ltd. operates under the direction and support of Canon Marketing Asia and Canon Singapore, Canon’s headquarter in both South and Southeast Asia. Besides distributor Le Bao Minh, Canon has over 300 agents in Vietnam.